This article addresses the effects that music can have on our neurophysiological systems, particularly as it relates to children with Cerebral Palsy (CP). Definition : Music therapy is the use of music by listening or playing, in a therapeutic way, to modify the cerebral process capturing the attention of the patient. 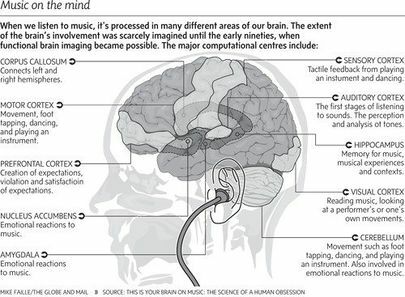 Playing, listening or composing music activates almost every known brain areas and nervous subsystems (Figure 1). Cerebral areas handling melody, rhythm and time have a rich connectivity with motor areas. Music improve our performances by fighting fatigue off or improving our work capacities thanks to an endurance, a power, a productivity or a strength higher than planned. Personal and situational factors influence potential benefits of music (Figure 2). Listening to sad music tracks causes a heart rate reduction and a blood pressure increase. A happy piece of music leads to a reduction of breathing frequency. Rhythmic stimuli such as a constant tempo facilitate brain attention. Music therapists often use rhythm techniques to improve attention and learning at nursery school. Stimulating effect occurs with a fast tempo higher than 120 bpm, with rhythmic and percussive characteristics. "Le tempo pour des exercices d’intensité modérée devrait être de 125-140 bpm" - the music tempo for moderately intense exercises should be between 125 and 140 beats per minute (bpm).. Music reduces effort perception by 10% for low to moderate intensity exercises. Pleasure linked to music occurs thanks to dopamine surge in nucleus accumbens. Indeed, brain analysis systems predict when the next strong time will happen. Brain experiences satisfaction when an anticipated time match with real one, or when a skilled musician tricks its expectations in an interesting way. Interest provoke atention, and these mixed factors produce dopamine emission. Music can also improve motivation and exercise compliance. We put ourselves on music rhythm even when we don’t consciously pay attention to it. Music therapy stimulates cerebral plasticity of several areas, including motor ones. Muscular activation provoked by rhythmic listening results from the initiation of hearing-motor ways. This facilitation is the neurophysiological basis of neurological music therapy, which uses music as a signal to improve functional movements. Sound signals improve strength and spatial parameters. So rhythm gives an anticipatory signal to the brain, which can plan and be ready. Spatial tasks performances are better after hearing a musical extract with a fast tempo and/or in a major mode than a slow one in a minor mode. Music increases the maximal power and the average one in an aerobic test. Most of the time, music is linked to significant endurance performances improvement. Concerning children, music combined to movement improves spatial relations, hearing and visual discrimination, eye-hand coordination and fine motor habilities. Hearing rhythmic stimulation improves walk length, speed, gait symmetry, without increasing the pace. It’s very efficient compared with traditional walk therapies. Ankle and wrist bands with jingles can be a nice way to encourage moving by playing music in the same time. Patterned Sensory Enhancement (PSE) is a technic making use of every music components such as tempo or mode. It structures motor patterns in space and time, and facilitates motor performances. An exercise is realized faster and with more motivation in the PSE group than in the control one. Gross Motor Function Measure (GMFM) has significantly improve during more than 3 months after PSE session. Nethertheless, PSE didn’t demonstrate significant improvement of daily routines and activities, strength nor gait. Music therapy session significantly reduces heart rate and blood pressure of children with Cerebral Palsy (CP). Listening to several music tracks focusing on rhythmic and melodic aspects of the pieces stimulates selective and long term attention. Short extracts allow us to maintain better attention. Music therapy programs significantly improve children motivation and social behavior. We can notice a particular improvement of communication, cooperation and other children awareness. To sum up, music therapy causes cerebral modifications in attention and emotional responses areas, with significantly effects on communication and social interactions. Did you know that Physioplus offers an online course on Managing Children with Cerebral Palsy? Click here for more information! There's a TedTalk about that! Learn about: Music on the brain with Jessica Grahn. ↑ Crépon F. Musicothérapie. Kiné scientifique 2006 ; 467 : 61-2. ↑ 2.0 2.1 2.2 2.3 2.4 Bringas ML., Zaldivar M., Rojas PA., Martinez-Montes K., Chongo DM., Ortega M.A. et al. Effectiveness of music therapy as an aid to neurorestoration of children with severe neurological disorders . Auditory Cognitive Neuroscience 2015; 427 (9) : 1-15. ↑ 3.0 3.1 3.2 3.3 Levitin D. This is our brain on music: the science of human obsession. Plume/Penguin ; 2007. ↑ 4.0 4.1 4.2 4.3 Thaut MH. The discovery of human auditory-motor entrainment and its role in the development of neurologic music therapy. Progress in Brain Research 2015 ; 217 : 253-66. ↑ 6.0 6.1 6.2 6.3 6.4 Karageorghis CI., Priest D-L. Music in the exercise domain: a review and synthesis (Part I) International Review of Sport and Exercise Psychology 2012 ; 5 : 44-66. ↑ Geist, K., & Geist, EA. Bridging music neuroscience evidence to music therapy best practice in the early childhood classroom: implications for using rhythm to increase attention and learning Music Therapy Perspectives. 2012; 30 :141-5. ↑ 8.0 8.1 Karageorghis CI., & Priest D-L.Music in the exercise domain: a review and synthesis (Part II) International Review of Sport and Exercise Psychology 2012 ; 5, (n°1) : 67‑84. ↑ 9.0 9.1 9.2 9.3 9.4 Wang TH., Peng YC., Chen YL., Lu TW., Lia HF, Tang PF. et al. A home based program using patterned sensory enhancement improves resistance exercise effects for children with cerebral palsy Neurorehabilitation and Neural Repair 2013 ; 27 ; (n°8) : 684-94. ↑ Sacks, O. Musicophilia. Tales of music and the brain. Vintage ; 2008. ↑ Husain G., Thompson WF., & Schellenberg EG. Effects of Musical Tempo and Mode on Arousal, Mood, and Spatial Abilities Music Perception: An Interdisciplinary Journal 2002 ; (no 2) : 151‑71. ↑ Kwak EE. Effect of Rhythmic Auditory Stimulation on Gait Performance in Children with Spastic Cerebral Palsy. Journal of Music Therapy 2007 ; 3 : 198-216. ↑ Orita M., Hayashida N., Shinkawa T., Kudo T., Koga M., Togo M. et al. Monitoring the Automatic Nervous Activity as the Objective Evaluation of Music Therapy for Severely and Multiply Disabled Children. Tohoku Journal of Experimental Medicine 2012 ; 227, (n°3) : 185-9.